How did the weeds get that big while I was busy planting. At least in my part of the world, it has been raining a little too much but that makes the soil soft and allows the weeds to be removed a bit more easily. The one benefit of the letting the weeds get large is the amount of garden you clear with the removal of each one. You are all aware of my addiction to Iris, well let me brag a bit. I did manage to win the best Iris trophy at the local flower show this week with a wonderful black called Dark Angel. It was tough to find good blooms to take after a huge wind and rain storm that went through here on Monday night. The early planting and the plentiful moisture is providing enough veggies to feed a small army. I tried to plant more strategically this year but eight plants each of two different types of Pak Choi does produce the opportunity to find new and innovative ways to prepare and serve it. I need to get it and the lettuce out of the way so that I can hill up the rows of Potatoes that they are growing between. For several years I have been growing Begonia boliviensis cv. Bonfire in several planters on my garage wall and I’m sure you have seen the pictures of how well they do. They have always been somewhat difficult to propagate by cuttings. This year I was given a package of seed of the Santa Cruz Sunset variety to trial. If you have been following “Dallying In The Dirt” for a while you will have followed their story. I planted them much too early. They got big and took up too much space. I had to cut them back once. They finally made it to their ultimate destination a couple of weeks ago and were cut back again on, planting, because they were getting leggy. They have done remarkably well in just those two weeks. I was worried that they might be too upright but they are now starting to cascade and the blooms are much larger than my previous variety. No more fighting with cuttings and next year I will start them much later. 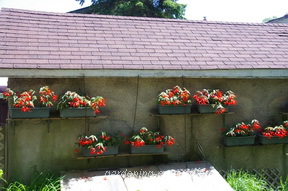 They just grew so much faster than any other seeded Begonia that I have had experience with. A success story. It has been a year of success stories in the garden. There are of course a few exceptions, as there always are but we won’t dwell on them today. The veggies are flourishing and we are presently enjoying an abundance of Peony blooms in many corners of the garden. A couple of them died under strange circumstances this winter but most have flourished and expanded. 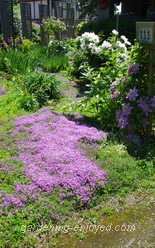 The creeping Thyme groundcover experiment in the front yard is beautifully in bloom, making the pathways between the beds look carpeted in purple robes. There are a few blank spots, there are actually never blank spots just areas where the Thyme has not beaten back the weeds just yet, but the rest of it is wonderful. I walk on it regularly and it smells wonderful and bounces back with no ill effects. The Assistant Gardener even asked if she should mow it but that was before it bloomed. She’s anxious to try out her new battery powered lawnmower that arrived to replace the rusting hulk that was becoming dangerous. Lynn Asks ? How can I improve the drainage in an existing flower bed? The soil has sunk over the past couple of winters and it collected a lot of water this spring. Nothing in the one corner at present but I want to 'bump it up' prior to planting something new. Thanks. Ken Answers! If drainage is the main problem then the soil is probably heavy in clay so add some coarse material such as sand that will help break up the clay and promote better drainage. Another Lynn Asks? I was given an Asparagus crown about 7 years ago. I planted it right away and it had been productive in it's previous garden. I do get a few stalks start in early spring but they are dismally thin and not worth picking. Plus only about 5 or 6 stalks come up in total every year. Should I try replanting the crown in a different spot or perhaps at a different depth? Ken Answers! I've never had much success transplanting established Asparagus. They can be huge things to dig up and you are bound to injure them somewhat. I do grow it from seed and transplant the one year old roots which seems to work quite well. 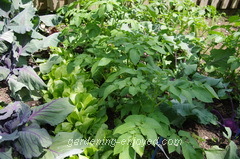 Needs a good rich soil to amend with lots of compost or whatever you have as you are transplanting. A good feed is probably three years away from the day you plant the seeds. You will get some in the second year but if you take too much the root will not get a chance to regenerate and increase. Linda Asks? For the last couple of years, I have found these really small ants in my garden, usually under a rock I have, I can't see where they are destroying anything, but I was wondering if it is a problem to have them in there. Should I try to remove them and if so how? Ken Answers! Ants are part of the natural environment, helping to aerate the soil and unless they are doing obvious damage or creating a large unsightly ant hill then just learn to like them as getting rid of them is a very difficult task. Bill Asks? 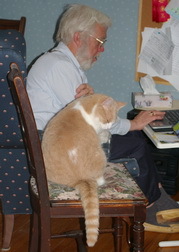 Hi Ken just been reading (googling) some articles about making compost tea and like most things on the internet its difficult to determine how effective the product is. Do you use compost tea, have a recipe and what are your general thoughts? Ken Answers! I have never used compost tea but I do have gardening friends that make it and confirm that it is really effective and a great way to make the benefits of a little compost cover more area. I think I'm just too busy (lazy) to do it. A little research led me to this site which seems to be good information and carries the authority of a university extension service.